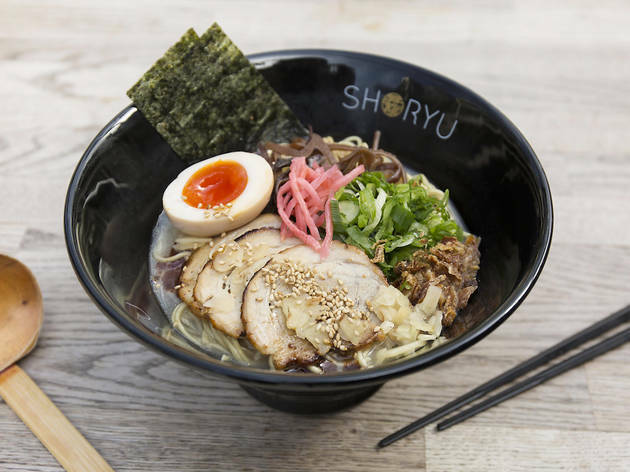 London food trends come and go, but if there’s one that deserves to ride out the zeitgeist, it’s ramen. 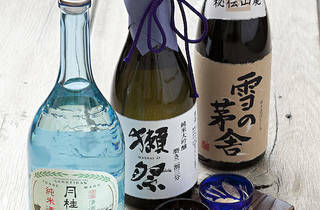 There’s a reason Japan basically runs on this stuff: when it’s good, it’s comforting, deeply flavourful and effing delicious. 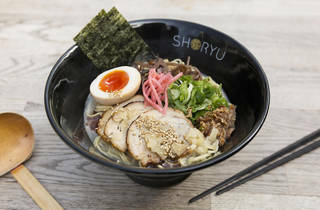 And at Shoryu – one of London’s more ubiquitous ramen chains – it is good. What’s more, it’s a nice place to be. 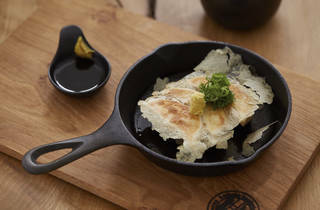 Tucked into Kingly Court, away from the bustle of Carnaby, the vibe here is ‘ryokan chic’ (that’s an antiquated Japanese inn). The room’s decked out in warm wood panelling, with a welcome gong by the door that you’ll hear bashed almost constantly. 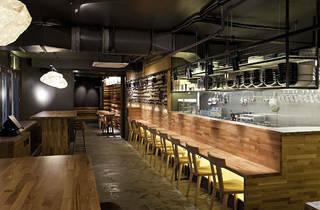 The menu is extensive: as well as a host of tonkotsu variations (that is, ramen with a fatty, collagen-laced pork bone broth), there are crowd-pleasing sundries like shellfish tempura, karage fried chicken, steamed shoryu buns (big fat bao, basically), even sashimi and sushi – plus trends-in-waiting like takoyaki octopus balls (we’re seeing them everywhere, honest!). The kotteri hakata tonkotsu, a sort of mildly pimped version of the house ramen, came with a heavier pork bone broth and a double helping (score!) of oozy-yolked, marinated eggs. 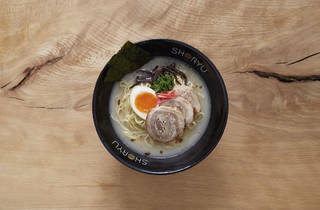 Very good it was too – perhaps lacking the punishing, purist-pleasing richness of the ramen sold at city-best joints like Kanada-Ya, but moreish all the same. The char siu pork slices were yielding, the helpings of pickled ginger and chopped spring onions generous. A bowl of karaka tan tan – a ramen with white-miso-spiced minced pig in place of the slices – was equally good, and fiery as hell. 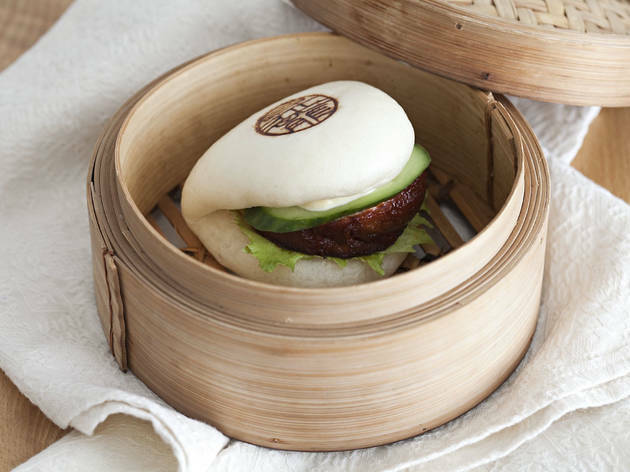 It was all tempered slightly by a decent shoryu pork bun, slicked with Japanese mayo (like a mayo/salad cream mix) and washed down with a teeny bottle of hatakosen ramune soda – a bubblegum-flavoured soft drink that’s nostalgic catnip for Japanese folks, and plain delicious for me. 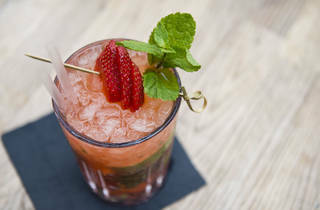 Who needs booze eh? 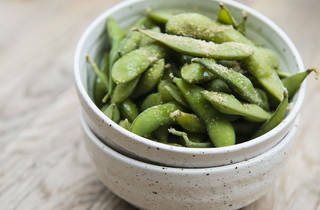 For a pitstop lunch or cheap-ish dinner, Shoryu’s a no-brainer. I’ll fill up my loyalty card in no time. 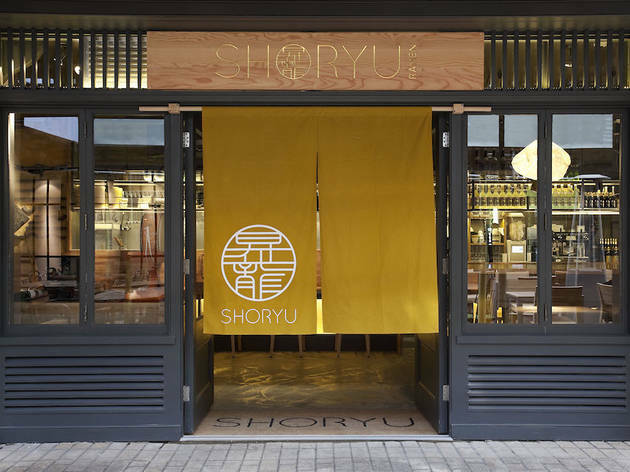 Shop till you drop in London’s premiere fashion district then enjoy funky vibes and alfresco dining at Shoryu Carnaby. 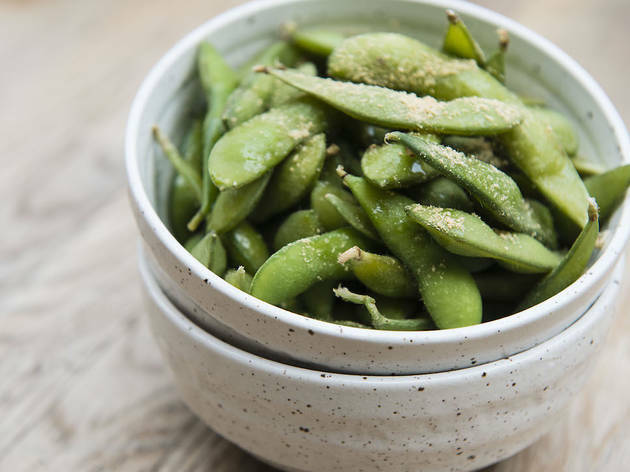 Situated in the magical Kingly Court, just off Oxford Street and Piccadilly Circus, there’s nowhere else to enjoy Japanese ramen under the sun or stars. 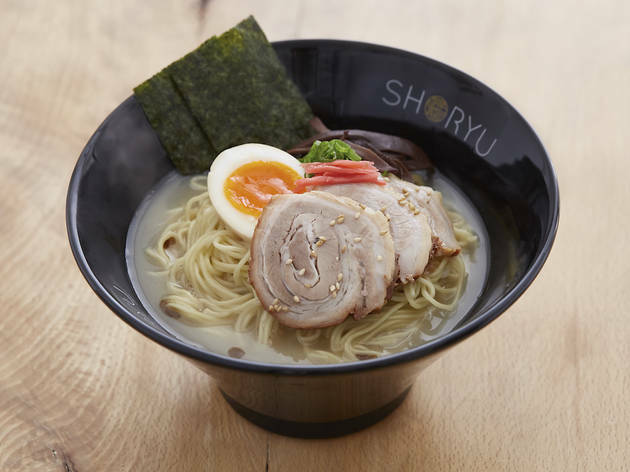 From the team behind Japan Centre, Shoryu Ramen launched in November 2012 and has been recommended in the Michelin Guide 2014, 2015, 2016 and 2017. 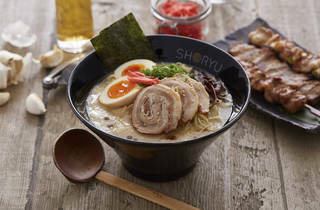 Shoryu Ramen specialises in Hakata tonkotsu ramen from the Hakata district of Fukuoka city on the southern island of Kyushu, Japan. 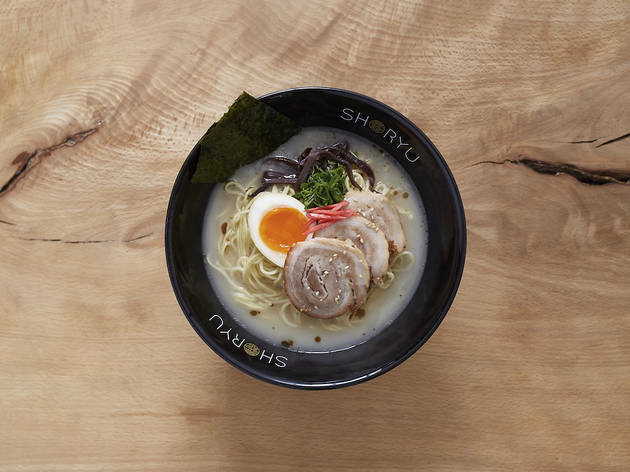 Hakata tonkotsu ramen is a style of ramen made with a thick, rich, white pork soup and thin, straight ramen noodles. 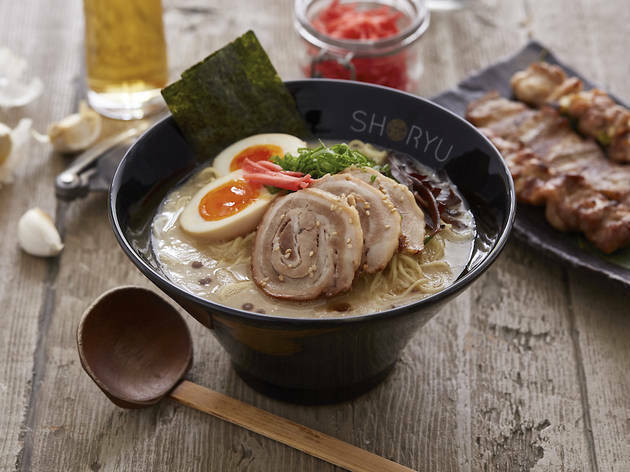 Our Hakata tonkotsu ramen recipe has been specially created by our Executive Chef Kanji Furukawa who was born and raised in Hakata, to provide the UK with highly crafted, genuine tonkotsu rarely found outside Japan. 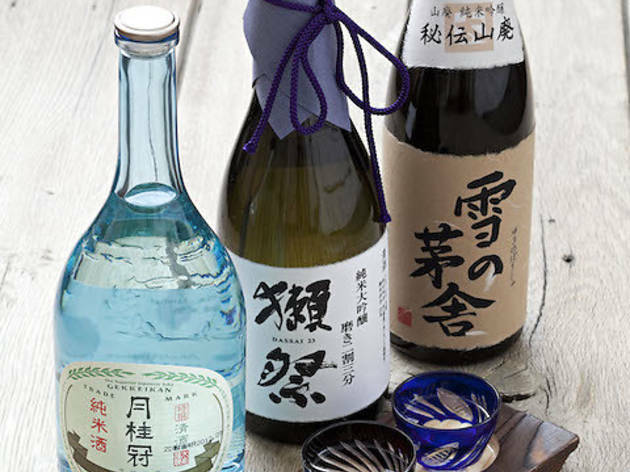 Shoryu's owner Tak Tokumine is also a native of Fukuoka city and along with Kanji is dedicated to championing his hometown’s local speciality. I will say though ..they had a cocktail which was so yummy I would go back for just that! Also they had a Happy hour which brought all their cocktails down from £10 and up to £6... Not bad at all. 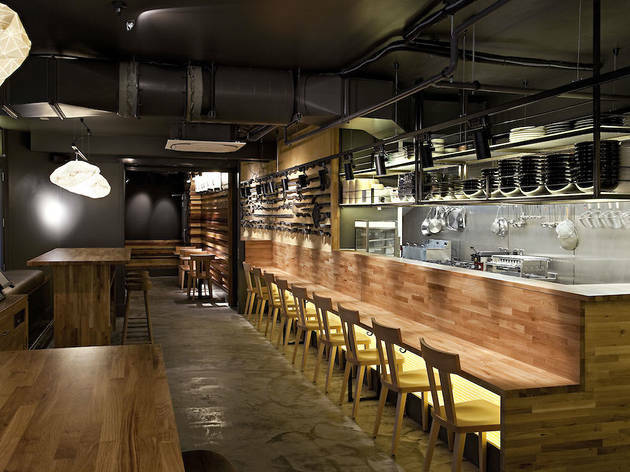 The ramen here is very good, extremely filling and great value for money. 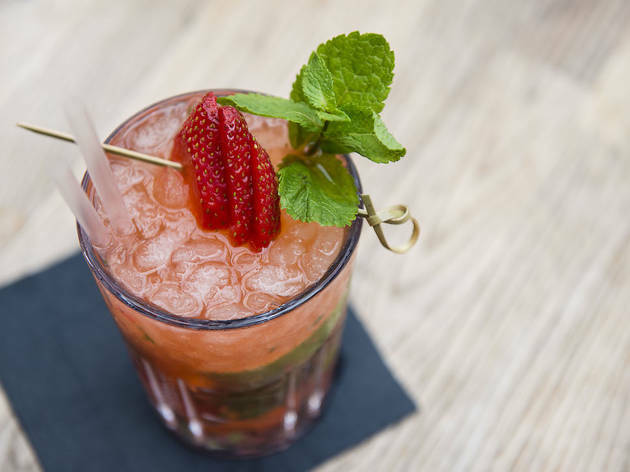 There is a wide selection of dishes that cater for all tastes and spice tolerances. The portion are great sizes - you won’t leave hungry. The staff were very attentive and welcoming. 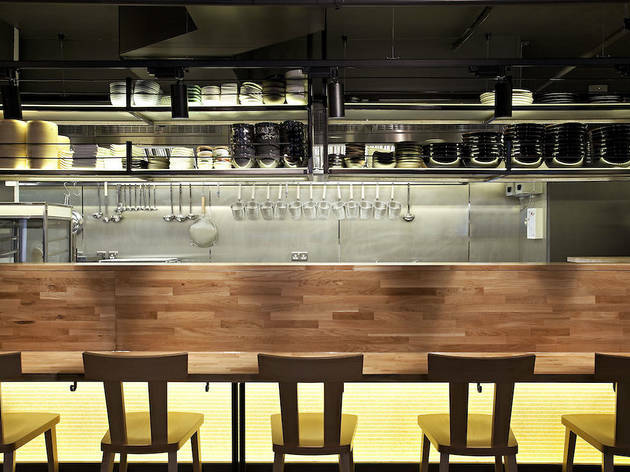 A great option for food if you’re in Soho. 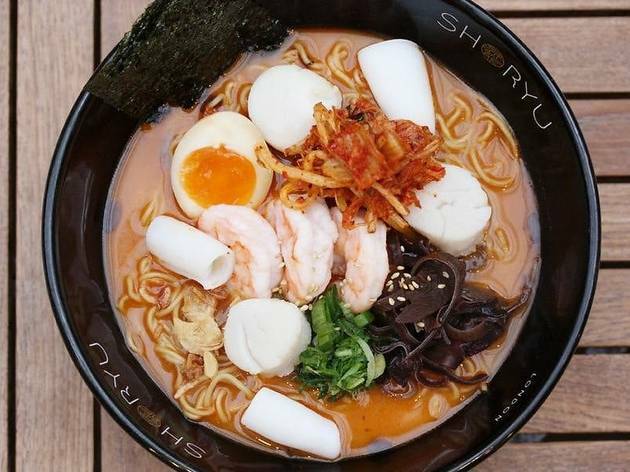 On a cold chilly day what is more comforting than a large steamy bowl of tempting ramen. 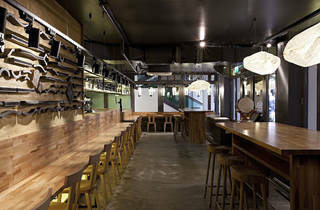 And situated in Kingly court here is a great place just for that. Visiting midweek it was easy enough to get a table. The staff are attentive and quick and friendly. 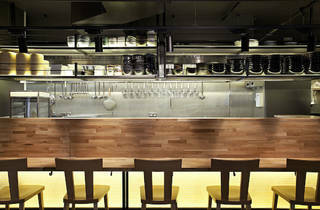 The décor is clean, simple and stylish, ample seating expect to share some tables and staff were attentive. 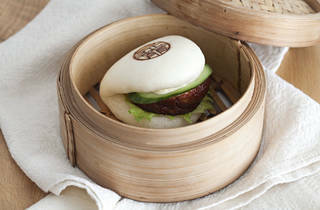 From the menu, for starters we opted for the steamed buns and shared the ginger salmon tatsutaage and chicken karaage shoryu buns where you can buy two for 7:50 which were fluffy and delicious. The batter coating on the chicken was particularly crisp and flavourful. Ordered the shoryu ganso tontoksu and the kimchi seafood tontoksu ramen. 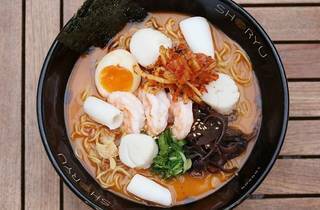 Compared to other ramen places, the bowls are fairly large and the broth fragrant with a decent mix and distribution of toppings. I really like the ramen here. The kimchi had a good bit of spice to it, plus it comes with and eggs and seaweed included which you don’t have to pay extra for.Shoryu has the bonus that they often have a few offers on such as 2 for 1 buns or meal deals and a loyalty card scheme as well so it is always a good idea checking these out too. 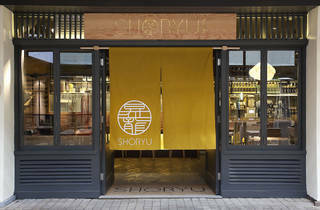 We actually visited the new Covent Garden branch of Shoryu, which is yet to be listed on Time Out. 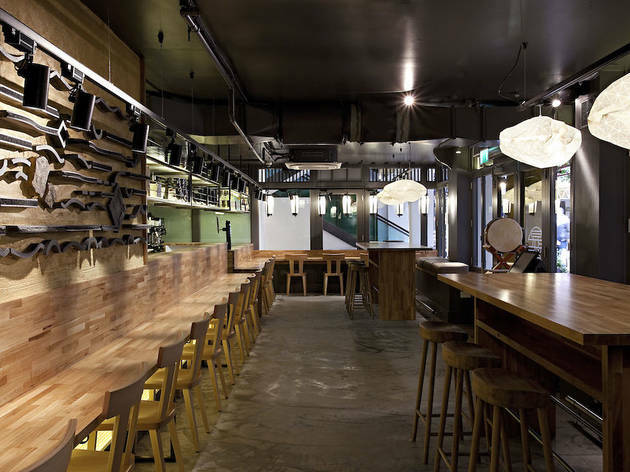 As part of their soft launch, they were offering half price ramen. We grabbed a table outside and enjoyed a lovely summer evening slurping some delicious noodles. Their Miso Wafu Chicken offering was tasty and light - at least compared to the thick and creamy Kotteri Hakata Tonkotsu that my boyfriend ordered. It was the service that absolutely made the night - welcoming, informative and expertly timed - the best we've received in a long time! 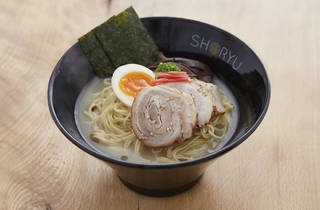 My girlfriend and I love to go to this branch of Shoryu Ramen. We usually go once a month or so because the staff are very nice. The food is good as well, and the service is really fast. 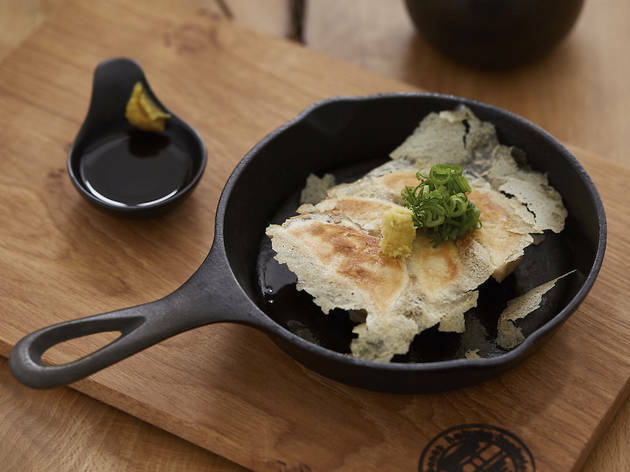 Prices are on the line for Japanese style restaurants in London (regular, even kind of cheap for London, but a tad expensive for somebody who's lived in Japan and seen the real deal). Will be going back again next month as usual.